In this section, we are going to look at overriding the view that we added with our feature module for the blog. I'm going to exit out of the overlay here and we're going to be editing this Blog view. In order for our adjustments to be meaningful, we need to have a couple of blog posts first, so I'm going to go ahead and go to Content and I'm going to go add content and I'm going to add a blog entry. And we'll just do a couple of dummy pages here. You can go ahead and put in anything here, and I'm just going to leave at the defaults and click Save. Okay. And I'm going to add one more piece of content; I'm going to click Add content, click Blog entry and then fill in the title and body again; and then I'm going to scroll down and click Save again. Okay. Now let's go back to the blog. I'm just going to click Blog in the menu here. So we're going to change a couple of aspects of this view. The first is we're going to change the title and then we're going to change the number of items that display here to one, and then we are going to enable Ajax for the pager that will now display since not all of the items display on one page. So I'm going to jump back to our file explorer and I'm going to open up the fourth step which is called Override Views Display Options. I'm going to copy all the code and paste it over the blogoverride dot module file, replacing everything that's there, and save it; and I'm going to scroll down to the bottom where we have the function blogoverride_views_pre_build(). Now, Views contains a lot of configuration options and we're just demonstrating a few here. So we're using the same structure that we used for -- if I scroll up -- our blogoverride_boxes_box_load_alter(). We're just doing a switch, but in this case we're doing a switch on the view name which is the machine name for a view; and in the case of blog view, we're going to make these modifications. So the first thing we're going to adjust the title and we're going to make it Overridden Blog Title. Now you can see the structure of variables here is really complex, and a lot of times it's going to be a little bit ambiguous as to where you need to make the change inside of this set of variables because there's a few different places where you'll see the particular parameter that you want to adjust. So you may need to do some experimentation. These items here should help point you in the right direction for a couple of the most common parameters to change; but again, beyond that, you just need to experiment. In this series we uncover how to use powerful tools to speed up and stabilize the Drupal development process. We begin with a thorough walk-through of Git, the version control system. After we cover how to patch modules and upgrade Drupal from one minor version to another, we demonstrate how to use the Features module to version control components of Drupal that aren't typically available to version control. Finally, we wrap up with how to integrate Drush - a powerful command line tool for Drupal - into your workflow to speed up the process of doing everything we discussed earlier in the series. How to work with the Features module to capture important database changes and make deployment easier. This video collection is mainly for developers who want to improve their deployment strategies and learn how to work on a shared Drupal code base with other developers. However, even if you are not a developer, our coverage of using Features and version control is extremely valuable for deploying Drupal sites and sharing reusable components between projects. Even if you are not a developer, you will be able to follow with most of this collection. When we talk about code we do not go into detail about the basic components of the code, so you may want to brush up on some coding basics in the "PHP Programming Basics" collection. 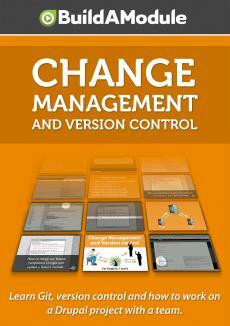 5:59Welcome to "Change Management and Version Control"